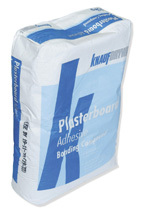 Knauf Plasterboard Adhesive. A multi-purpose gypsum-based adhesive for use with Knauf Metal Furring Channel and for direct bonding of Knauf Plasterboards and Insulating Laminates. Should not be used for moisture resistant or vapourcheck boards.